Our standard hard cards have rounded corners and a durable glossy coating. 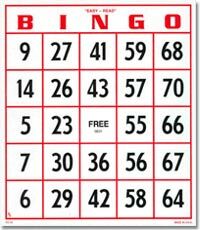 Each Bingo Hard Card measures 4.75 inches x 5 inches. Quality manufacturing ensures that you will be able to use these bingo cards again and again. 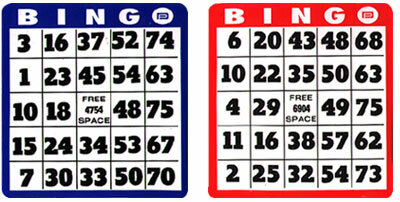 Our Bingo Hardcards are available in 4 different colors including: Black, Blue, Green, and Red. Available in packs of 100 per box. (All one color) *Sorry, we cannot mix colors. Jumbo Size/Easy Read Bingo Hard Cards are also available. These cards are made of heavy-duty cardboard and feature over-sized numbers. Card Size: 8" x 9¼"